Groupama 4 rounded the Rock off the southern tip of Ireland four minutes ahead of Abu Dhabi Ocean Racing’s Azzam at exactly 1700 GMT. Team Sanya were around 30 minutes behind, with conditions getting worse for the three boats who will contest the Volvo Ocean Race 2011-12 and forecasts of winds up to 25-35 knots and swells as high as five metres. Team Sanya, the only one of the three in an older-generation Volvo Open 70, had enjoyed the lead overnight after breaking formation with the other boats in a strategy devised by Norwegian navigator Aksel Magdahl. Sanya tacked early in around 12 knots of breeze and the boat passed close to the headland at Land’s End on a much more northerly route to the other two teams late on Sunday. Ian Walker on board Abu Dhabi Ocean Racing’s Azzam and Franck Cammas on Groupama 4 experienced lighter winds overnight on their more southerly course and the move gave Sanya a clear advantage but as day progressed the two brand new boats caught up and all three were abreast as they powered towards the Fastnet Rock. The 608-nautical mile race is likely to finish in Plymouth on Tuesday for the fastest monohulls, including the three Volvo Open 70s. The monohull record is for one day 20 hours and 18 minutes and that could be under threat, depending on conditions for the remainder of the race. Sanderson, speaking by satphone at 1500 GMT today, gave a flavour of how close the boats were to each other. “We've got Groupama 4 about two miles to windward and about a mile in front and we've got Azzam about five miles to windward and basically sort of neck and neck,” said Sanderson, who skippered ABN AMRO ONE to victory in the Volvo Ocean Race 2005-06. 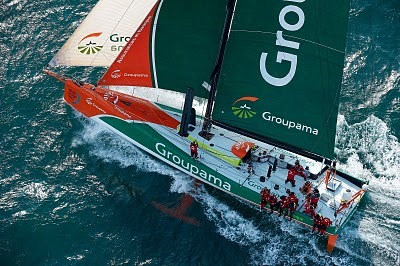 Groupama 4 skipper Franck Cammas echoed that view. "The boat is going faster and faster,” he said. “We are now sailing at 19, 20 knots. It's starting to get wet here on deck. We can see Azzam upwind and Sanya downwind. It's a beautiful fight, a real sprint tot the Fastnet." According to Walker, the British double Olympic silver medallist whose Abu Dhabi Ocean Racing team enjoyed the best start on Sunday, conditions are set to get windier now that the boats are around the rock and heading for the finish line in Plymouth. “We are looking at 25 to 35 knots,” he said. “It will be windy and it will be miserable but we will have the daylight, which is always nice." The closeness of the three boats’ performances so far during this race will be of interest to the other teams Volvo Ocean Race 2011-12 -- PUMA Ocean Racing powered by BERG Propulsion, Team Telefónica and CAMPER with Emirates Team New Zealand, with the event starting on October 29 in Alicante.